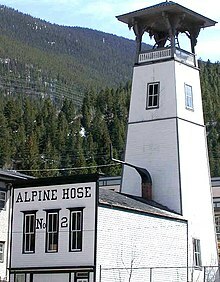 Alpine Hose, historic firehouse in Georgetown. Wikimedia Commons has media related to Dixie Mine. Clear Creek County is one of the 64 counties of the U.S. state of Colorado. As of the 2010 census, the population was 9,088. The county seat is Georgetown. Clear Creek County tends to be somewhat divided between Republicans and Democrats. In the 2012 election, Barack Obama won over Mitt Romney 54% to 42%. In the county, the population was spread out with 22.60% under the age of 18, 5.60% from 18 to 24, 32.60% from 25 to 44, 32.20% from 45 to 64, and 7.10% who were 65 years of age or older. The median age was 40 years. For every 100 females there were 108.80 males. For every 100 females age 18 and over, there were 110.20 males. This page was last edited on 26 June 2018, at 18:31 (UTC).